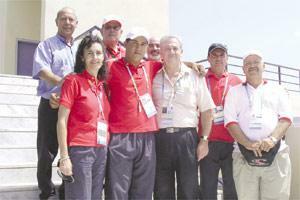 William Chetcuti (second from left) is flanked by officials from the MOC and the Malta Shooting Federation yesterday. Lino Farrugia Sacco, president of the Malta Olympic Committee (MOC), yesterday hailed William Chetcuti's ninth-placing in the Double Trap competition as the best result achieved by a Maltese athlete in the Olympics in the last 20 years. Chetcuti, billed by many as Malta's best prospect for a medal in the Athens Games, was a whisker away from qualifying for the final. A missed clay in the shootoff ended Chetcuti's participation in Athens after the Maltese was joint-sixth on 134 hits at the end of the qualification round. The best six shooters entered the final 50-shot barrage with Ahmed al-Maktoum winning the United Arab Emirates' first Olympic gold medal with a total score of 189. Mr Justice Farrugia Sacco had words of praise for the talented Maltese shooter in spite of his failure to make the final. "This is by far the best result achieved by any Maltese athlete in the Olympics since 1984," Mr Justice Farrugia Sacco said. "William offered a tough challenge to some of the world's best shooters in this discipline and was unlucky not to qualify to the final. "Chetcuti was the youngest shooter among the 25 participants. He showed great skills throughout the competition and it was obvious that had Chetcuti been exposed to more international competition, I am sure his score would have been higher," the MOC president added. "Unfortunately, William does not have the same level of competitive experience as his rivals and that made the difference." Mr Justice Farrugia Sacco was quick to point out that for Malta to stand a realistic chance of striking an Olympic medal in Beijing 2008, athletes with exceptional talent should be granted all opportunities to fulfil their potential. "Judging by today's events in the Double Trap, it is evident that if Malta is to taste success in the Olympics, our efforts must be focused on two or three athletes who have an extraordinary talent like William Chetcuti," the MOC head said. "In the next few weeks, we will be reviewing our athletes' performance in these Games in a bid to identify the best policy for our preparations ahead of the 2008 Games in Beijing." Chetcuti is expected to return to Malta this morning. Also on the same flight from Athens will be Judge Farrugia Sacco, MOC secretary Joe Cassar, coach Jimmy Bugeja and Malta Shooting Federation president Saviour Portelli.